Professor Dr. Mohammed Masum Iqbal, Dean, Faculty of Business and Entrepreneurship of DIU and Mr. Munir Hasan Khan, Founder & CEO, Impra American Educational Network (IAEN), USA exchanging MoU between them at the MoU signing ceremony. 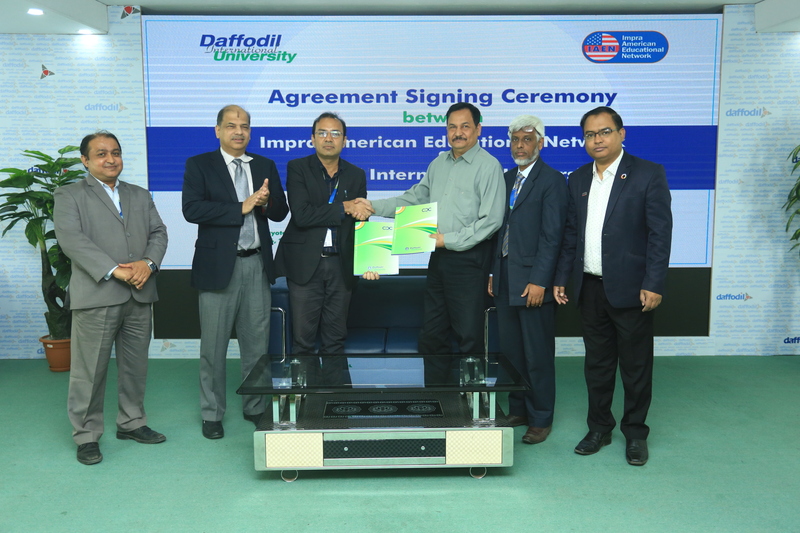 Aiming to making academic collaboration and spreading higher education all around the world, a Memorandum of Understanding (MoU) was signed between Daffodil International University (DIU) and Impra American Educational Network today on 6th February, 2019 at 71 Milonayoton of the university. Professor Dr. Mohammed Masum Iqbal, Dean, Faculty of Business and Entrepreneurship of DIU and Mr. Munir Hasan Khan, Founder & CEO, Impra American Educational Network (IAEN), USA signed the agreement on behalf of their respective institute. Professor Dr. Yousuf Mahbubul Islam, Vice Chancellor of DIU was present at the agreement signing ceremony as the chief guest. Mr. Gouranga Chandra Debnath, Assistant Professor and Head, Department of Business Administration, Mr. Mohammad Shibli Shahriar, Associate Professor and Head, Department of Innovation & Entrepreneurship, Professor Dr. Md. Fokhray Hossain, Director, International Affairs were also present at the program. It may mentioned that Impra American Educational Network is a sister concern of Impra Consulting International based on USA, Mexico and Bangladesh and full service Business Consulting firm focused on small and medium size companies.